Sergio Gabriel Martínez was born on 21 February 1975, in Avellaneda, Buenos Aires, Argentina, to Susana Griselda and Hugo Alberto Martinez. He is an Argentinian former professional boxer, best known for being named the third best pound for pound boxer in the world, and the winner of the WBC, WBO, Ring magazine and lineal middleweight titles. 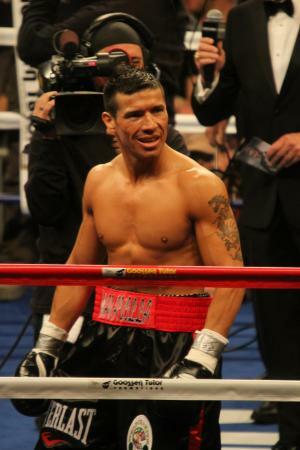 A famous boxer, how rich is Sergio Martinez? Sources state that Martinez has established a net worth over $5 million, as of mid-2016, acquired during his 17-year boxing career which began in 1997. Martinez grew up in the Buenos Aires Province, along with his two siblings. He dropped out of school at 14, and spent most of his childhood years working on construction with his father. He excelled at soccer and was also an avid cyclist. In 1995 Martinez began to train at boxing with his uncle, and several weeks later made his amateur debut, eventually setting a record of 39-2. In 1997 he began to compete at the professional level, going undefeated in his first 17 fights, holding a record of 16.0.1. He suffered his first defeat by former world champion Antonio Margarito in 2000 in Las Vegas, his first fight outside Argentina. After returning to his homeland, he went on to fight and win eight times from 2000 to 2002, earning the Argentina welterweight title by defeating Javier Alejandro Blanco, and defending the title by defeating Sergio Acuna. After being stripped of the title, Martinez moved to Guadalajara, Spain, and went on with training with Gabriel Sarmiento, securing four victories from 2002 to 2003. In 2003, he won the IBO 154- pound world title by defeating Richard Williams in England. He defended the title twice in the UK, in a fight against Adrian Stone and then in a rematch against Williams. After returning to Spain, he captured seven victories in a row over the next two and a half years. His net worth started to rise. Martinez took the Interim WBC 154-lbs. title by defeating Alex Bunema in California in 2008. The following year he fought to a draw against former welterweight world champion Kermit Cintron in Florida. Soon after that, the WBC upgraded Martínez’s title status to full WBC at 154 lbs. due to the inactivity of title holder Vernon Forrest. In a 2009 non-title fight against the welterweight world champion Paul Williams, Martinez was defeated, marking the second loss in his career. A year later, he defeated the middleweight world champion Kelly Pavlik, earning the WBC, Ring magazine and WBO middleweight championships. His wealth and fame was boosted. However, due to the WBO rules prohibiting a fighter from simultaneously holding titles in multiple divisions, Martinez vacated the WBO Light Middleweight title, keeping his WBC Middleweight belt. He avenged his loss to Williams in a rematch later that year, earning The Ring’s Knockout of the Year award and Fighter of the Year awards by both The Ring and the Boxing Writers Association of America. He was also named Boxer of the Year by WBC in 2010. In 2011 he defeated the WBO light middleweight champion Sergiy Dzindziruk, earning the WBC Diamond belt. He went on to win against the undefeated EBU middleweight champion Darren Barker in 2011, and defended his The Ring title against the No. 3 Ring Middleweight Matthew Macklin in 2012. The same year Martinez won against Julio César Chávez Jr., earning his second Boxer of the Year award. This was the fight in which he broke his left hand and tore his right meniscus, however, that didn’t prevent him defeating Ring Top 10 Middleweight Martin Murray in 2013. Several knee surgeries followed, and Martinez’s health deteriorated, causing him to lose his WBC, The Ring and lineal middleweight titles to former world champion Miguel Cotto in 2014. The knee injuries, as well as aging, led the fighter to retire from boxing in 2015, being aged 40. Aside from his boxing career, Martinez is the author of a book “Corazón de Rey” (“Heart of a King”). In his personal life, Martinez is divorced and lives in Madrid, Spain. He is an advocate for anti-bullying and against domestic violence towards women.